On August 20, I went with another member of the Labor Black League for Social Defense to a rally at the UAW [United Auto Workers] Local 2244 union hall in Fremont, California, called to save jobs at the NUMMI auto plant that GM and Toyota are shutting down. At the rally start time, the crowd was mainly retirees and a handful of union officials and their families. By about 1:30 p.m., people began marching in a picket line demonstration in front of the union hall, which we joined in order to distribute Workers Vanguard and talk with protesters. Day-shift workers were still on the job while we were there, but after a while some UAW swing-shift workers joined the rally, as did a handful of low-level bureaucrats from the SEIU health care union. With everyone marching in the street and rally organizers working from the retirees’ office, the main union hall was eerily vacant. Not even chairs or a podium were set up. I had gone into the hall to revisit the site of mass meetings in 1981-1982 of my old union, UAW Local 1364. Back then, the UAW Militant Caucus was arguing for a sit-down strike to save our jobs when GM, then the plant’s owner, planned to close it and shift production to plants in the East. As we said at the time, a sit-down strike at Fremont could have sparked an industry-wide struggle, including similar actions across the country, and pointed the way for millions of desperate workers fed up with layoffs and concessions. Since the Militant Caucus (originally named the Committee for a Militant UAW) was formed in 1973, we had fought to build a class-struggle leadership of the union and to mobilize the union economically and politically against our class enemies, the auto companies and their political parties, the Democrats and Republicans. We demanded jobs for all through a shorter workweek with no loss in pay to combat layoffs and unemployment, as a part of a broader struggle to do away with the boom-and-bust cycle by expropriating the capitalists and bringing the working class to power. We took on the pro-capitalist labor bureaucracy, whose ties to the Democratic Party subordinate the union to the capitalists. In a leaflet we put out before the plant finally closed in 1982, we pointed out that, in contrast to the worthless con game of appeals to the company, Congressmen and mayors, “There is only one real answer to GM and that is to use the power of the union before that power is taken away by putting us out on the street. GM cares a lot more about their machinery than about us and our families.” By occupying the capitalists’ factories, auto workers nationally could have forced concessions from the capitalists instead. As I stood alone now in the cavernous hall, I remembered speaking for our caucus at a contentious meeting of hundreds of union members in late 1981. When we called for a sit-down strike, it struck a real chord, especially among a small number of very experienced workers who took up the call and fought for it. Local 1364’s union bureaucrats countered with the argument that these tactics were OK in the 1930s but were now illegal, and union members needed instead to get out the vote for the Democrats. Unfortunately, the bureaucracy’s fearmongering and defeatism prevailed. In all, close to 6,000 auto workers from the Fremont plant were laid off and thrown onto the streets of Reagan’s America. The UAW International had negotiated an agreement with GM that high seniority laid-off Fremont auto workers would be offered assembly-line work in GM plants around the country if positions became vacant (which was unlikely during a recession). But if these older family men couldn’t leave the state, all their separation benefits were cut off. In the immediate aftermath of the plant closure about a dozen older union brothers died, some from heart attacks, some by suicide. It certainly struck me that now, in 2009, there was no debate in the union hall over the strategy of fighting against the plant closure by mobilizing the power of labor independently from the capitalists. When GM and Toyota opened NUMMI in 1984, the UAW dissolved Local 1364, which had earned a reputation for militancy over the years. Hiring at NUMMI was not done according to Local 1364 seniority. Instead a new union, Local 2244, was formed. Individuals who had been part of Local 1364’s bureaucracy initially worked in NUMMI’s personnel office to assist management with the hiring/screening process of former GM workers. (I always suspected that they were screening out the militants.) The UAW bureaucracy’s line since 1984 that NUMMI represented a new partnership between labor and capital—“team spirit”—has now borne rotten fruit during an economic recession far worse than when the Fremont GM plant closed in 1982. As the demonstration got larger, the marching stopped and everyone gathered up in order to become an audience for union bureaucrats, Democratic Party politicians and businessmen speaking from a stage set up in the union hall parking lot. The audience cheered for three bills designed to create tax incentives to keep NUMMI open that have been introduced by Democrats in the California State Legislature. Union members were urged to “call your state legislators today!” The featured rally speaker was Lt. Governor John Garamendi, who passionately urged union members to send a message to Toyota that “we know that you’ve got a very tough, a very difficult divorce with old, bankrupt General Motors, but...come out of that divorce, and you’ll have a new lover right here in Fremont.” He called the proposed incentives a “wedding ring.” He was hugged by UAW bureaucrats on the stage and loudly cheered by the audience. The UAW bureaucracy has offered every sort of concession short of dissolving the union as a sign of loyalty to American capitalism. Today, as they have for decades, UAW bureaucrats trade jobs for union stock shares and seats on the U.S. automakers’ boards, as tens of thousands of auto workers are put out on the street. Gettelfinger denounced Toyota as ungrateful, but the New York Times noted that he made no mention of GM, which pulled out of the joint venture as a result of the union-supported bankruptcy deal. It was the pullout of GM that precipitated this plant closure. The UAW bureaucracy’s chauvinist protectionism is all too familiar. I remember the last meeting before the plant closure in February 1982, where we argued against this same racist poison. Speaking from the floor, I denounced the anti-Japanese statements made by the officials. I argued that our union should have no part of such a policy, as it was the opposite of everything we stood for. I pointed out that trade wars historically lead to shooting wars, and that such racist crap is also the program of the KKK race terrorists. Further, the answer to worries about plants moving to Mexico was for the UAW to help organize Mexican auto workers. For all the protestations of Toyota executives today that they are not closing the plant to rid themselves of the union, Fremont NUMMI was Toyota’s only unionized U.S. plant. Toyota has five other plants in the U.S., all non-union—four in the South and one in Indiana (with the opening of a brand-new plant in Mississippi delayed by the recession). The UAW tops do nothing to organize the non-union plants and have nothing bad to say against GM, but complain about Toyota, playing up anti-Japanese nationalism. So now as in 1982, in this and many other ways, poisonous protectionism is cranked up to cover for the bureaucrats’ opposition to any struggle. The UAW membership has suffered this new defeat not in struggle, but as in 1982 by the hand of the UAW’s pro-capitalist leadership, from the International to the local level. Down With the Occupation of Afghanistan! All U.S. 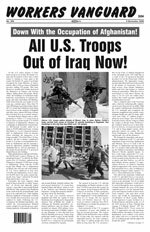 Troops Out of Iraq Now! Down With the Witchhunt! Decriminalize Drugs! No Illusions in Bourgeois Liberals—For Workers Revolution!